1. Using a spice grinder, grind the cumin seeds, coriander seeds, peppercorns, cardamom seeds, cloves and cinnamon to a fine powder. 2. In a food processor, blend the ginger, garlic, chillies and white wine vinegar to a paste. 3. Mix the ground spice mixture with the paste until well combined and season with a pinch of salt. Rub the mixture all over the meat using your fingers, then set the meat aside, covered, to marinate for 1½-2 hours. 4. Heat four tablespoons of the oil in a non-stick pan. When the oil is hot, add the onion and fry for 3-4 minutes, or until golden-brown. 5. Add the marinated chicken pieces and fry for 6-7 minutes, turning once, until golden-brown on all sides. Reduce the heat to low, cover the pan with a lid and cook for 35-40 minutes, stirring occasionally. Add small splashes of boiling water to the pan as necessary if the juices in the pan dry out. Add as little water as possible as the resulting sauce should be quite thick. Check for seasoning and add a little sugar or extra vinegar if preferred. 7. Once the mustard seeds start to pop, add the cashew nuts and fry for 2-3 minutes, stirring occasionally, until the nuts are golden-brown. 8. 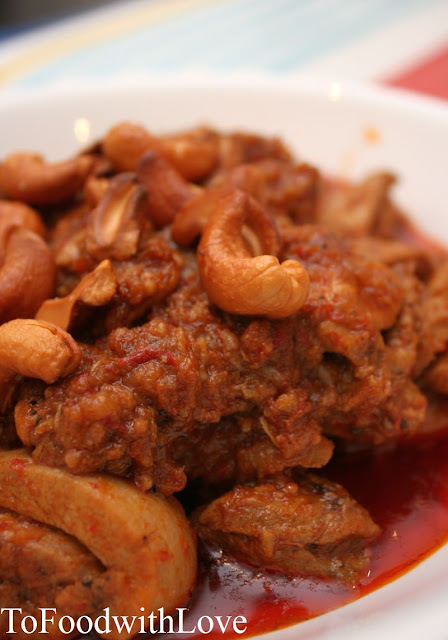 Pour the fried cashew nuts and mustard seeds over the vindaloo and serve with basmati rice.